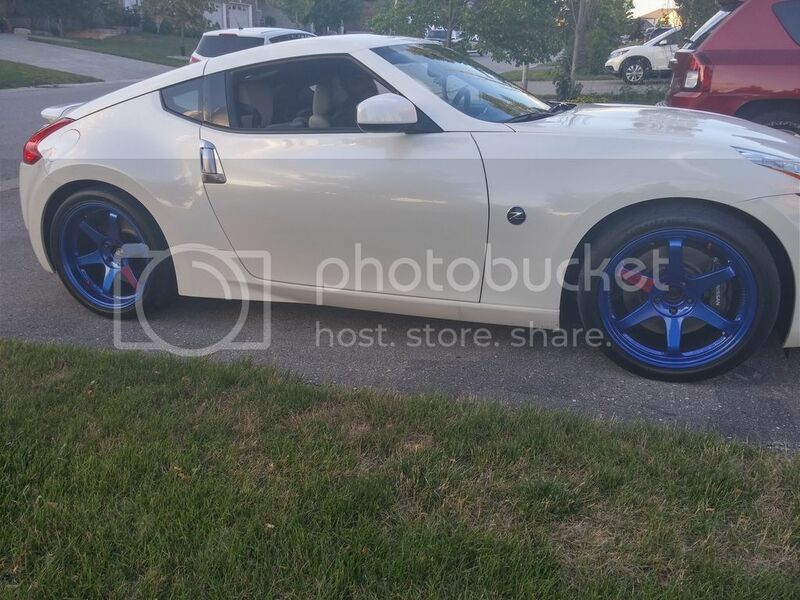 Trading the Z in possibly this weekend and I don't really want to give them a set of hyper blue TE37SL's. Does anybody have a set of stock 19" rays with rubber they'd be willing to sell me. I would possibly be open to a trade plus cash for my volks but since time is a factor I'd probably just buy the wheels. Please PM me if you have a set to sell. The SL's are 19x9.5/10.5 +22/+12 and the rubber is 1 season old hankook RS3 in 275/35/19 and 305/30/19. I ran them on stock suspension for a few months and they do fit fine with zero rubbing. The wheels and tires are near perfect with no rashes or anything. If somebody was interested in a trade plus cash I would be open to $3500 plus your stock rays with rubber. I think that's a steal considering what that setup goes for new. Please let me know. what are you trading the Z in for ?! A GT350 and then hopefully a 300zx project soon. Anybody have a set a oem rays with halfway decent rubber? I really don't want to hand over a set of te37's to a dealership. Buy a set of cheap after markets from Craigslist and swap them out! Nobody close to London with some OEM rays for sale? ive got a brand new 2018 nismo rays wheel with 1000 km on it. if you decide to trade with mine i can only add a very small amount of change on top of the trade. ill pm you my cell number, text me there if your interested. Better be careful as the stealership may have given you a trade in value that includes the SL's. If they are not on the car they could back charge you for the retail difference of the wheels. Or even refuse your trade and then; where would you be? It could get very messy, in a hurry. Finds some OEM 18's. You could find a set between $1200-$1500 easily. Luckily I found a reasonably cheap set in Etobicoke the day I went to trade the car. The trade-in number was for the car with oem rays so I didn't have to worry about the volk's factoring in. They only wanted the car with the oem rays. I brought home a '16 gt350 track pack a few weeks ago. Now I just have to stare at it in the garage for another month while this southern Ontario extended winter nonsense hangs around lol. I'll likely post a proper for sale thread for the SL's now that they're off the car. A Mooostang GT 350??? Please stay away from the crowds at the local cars and coffee. All kidding aside, you will need to change your member name, and best of luck with your new whip. Haha I'll try my best. Hopefully all the practice I had in the slower Z cars will set me up for success lol j/k. I sorta miss the low slung, tossablility (new word?) of the Z but every time I wring out the flat plane voodoo in the gt350 it more than makes up for it. Just need the weather to cooperate and maybe a bit of rain to wash all the damn salt away.